la vida lotto: Car Mechanic from Britain Wins Euromillions £108m Jackpot! Car Mechanic from Britain Wins Euromillions £108m Jackpot! A 41-year-old cam mechanic and hot rod racer from Couldson, South London after he scooped the massive Euro Millions Superdraw Jackpot on the March 14th draw. 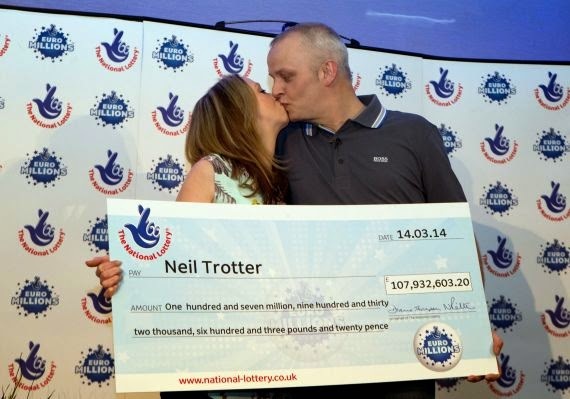 Neil Trotter had won a total of £107.9 million, and he says that he knew he would win all along. "I've always thought I'd win big and I'd had a good feeling all week," said Neil, but of course, nobody believed him. When his fearless forecast finally came true, his partner Nicky and his father thought he had gone insane.